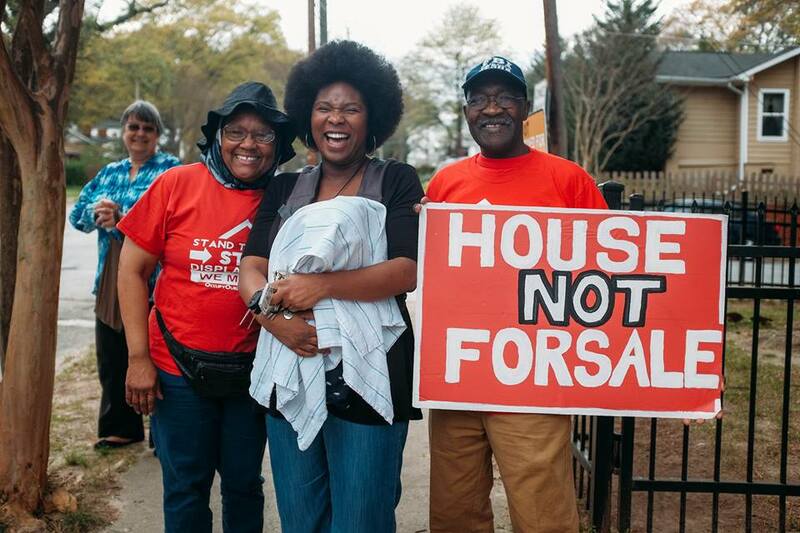 On Saturday, March 19th people sprang into action to prevent displacement in Peoplestown. 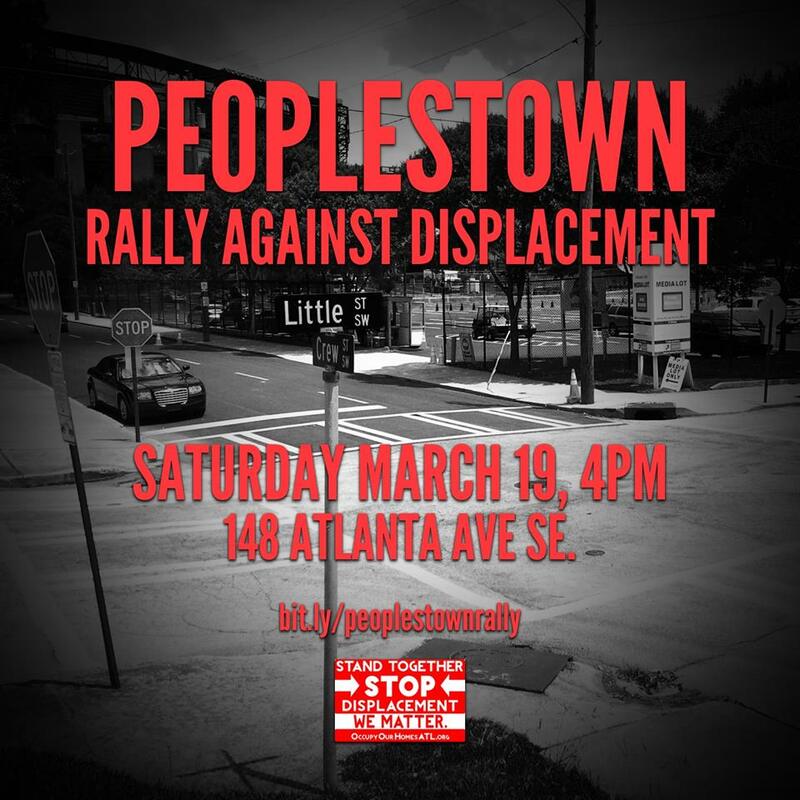 The day began with a bus tour of neighborhoods that will be affected by the Turner Field development deal and ended with the Peoplestown Rally and March Against Displacement. 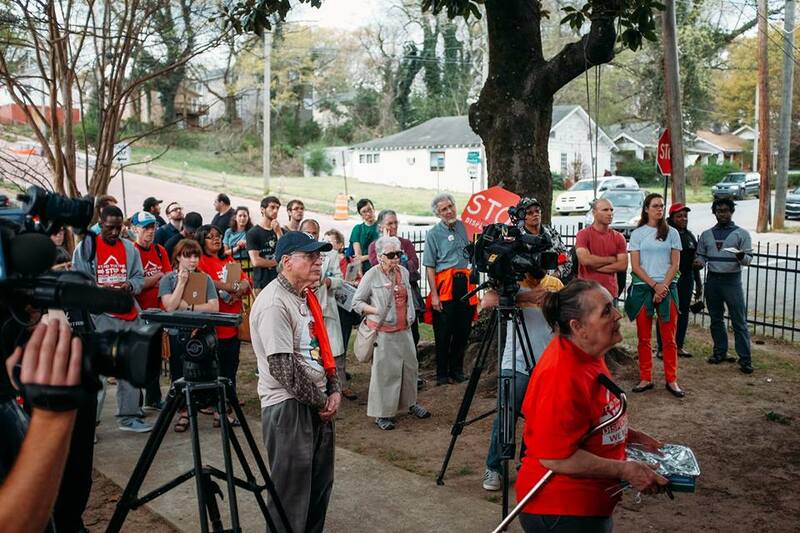 The Bus Tour was made possible by support from the Metro Atlanta Democratic Socialists of America and Peoplestown Revitalization Corporation. We are also grateful we had students and professors from Georgia State and Georgia Tech with us on the Tour. We started the day off with introductions to the work that is happening around Housing Justice in the Peoplestown, Mechanicsville and Pittsburgh neighborhoods. Columbus Ward (pictured to the left) discussed his work in Peoplestown with the Peoplestown Revitalization Corporation throughout the years. There were discussions around previous development deals in the neighborhoods and how that has affected the neighborhoods today. The presentations gave insight into what people would be seeing on the tour. After presentations, we embarked on the Bus Tour. The first stop was Stanton Oaks, which was formerly Boynton Village, in Peoplestown. Sherise Brown (pictured to the right) spoke about her experience with Stanton Oaks/ Boynton Village. Mrs. Brown spoke about how tenants organized to make sure that Boynton Village remained affordable even after being bought by a different company. She discussed her experiences with renovations of the complex, ensuring that Stanton Oaks got a new 20 year HUD contract, and the tenant association at Stanton Oaks. Folks had the opportunity to ask questions about her experience and what it is like at Stanton Oaks. The next stop on the Tour was City Views at Rosa Burney in Mechanicsville. Deborah Arnold shared her experience organizing tenants to ensure that City Views remained and remains affordable and that everyone living at City Views has a good, quality standard of living. The Peace by Piece House in Pittsburgh was the third stop on the Bus Tour. Peace by Piece is an AFSC program thats mission is to support and mobilize Black youth and young adults through political education and organizing in order to realize sustainable, sovereign and equitable communities rooted in Black love. Joel Dickerson, and Khadijah Austin, both from Atlanta, spoke about their experience with renovating a house and community garden in Pittsburgh. 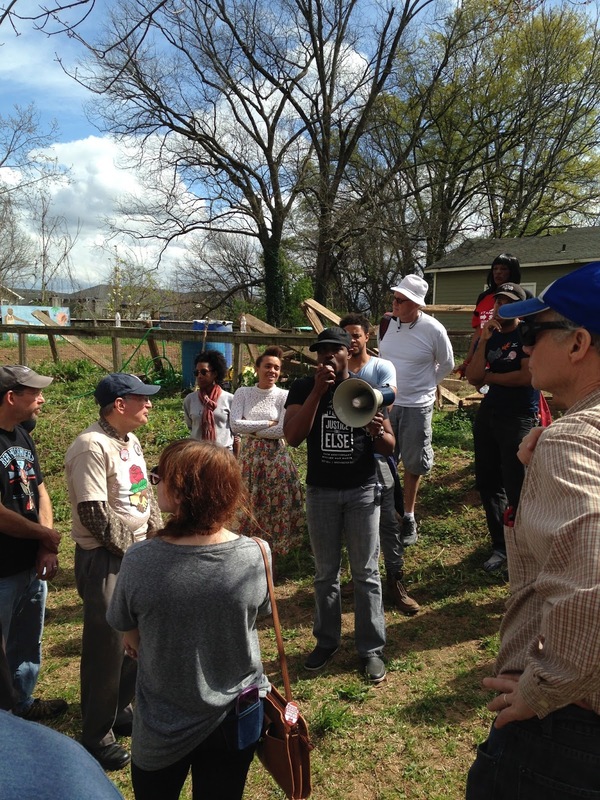 The house and the garden are going to act as Peace by Piece Atlanta's hub. 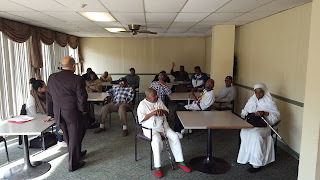 Farajii Muhammad spoke about the Peace by Piece and his experience organizing in Baltimore, Maryland. Khadijah gave a tour of the house and showed recent renovations. Joel gave a tour of the garden next door. By the end of the day 17 people signed up to help volunteer with renovations at the house. The final stop on the Bus Tour was Tanya Washington's House 148 Atlanta Ave SE in Peoplestown. Once everyone got off the bus we joined Tanya Washington, Mr. and Mrs. Darden, and Miss Mattie Jackson on Tanya's yard. We stood in Tanya's yard and listened to spoken word and resident's stories. Mr. Darden Mrs. Mattie Jackson, Senator Fort, and Tanya Washington spoke about Peoplestown, gentrification, and this block fight. After Tanya spoke, we started the March around the block. 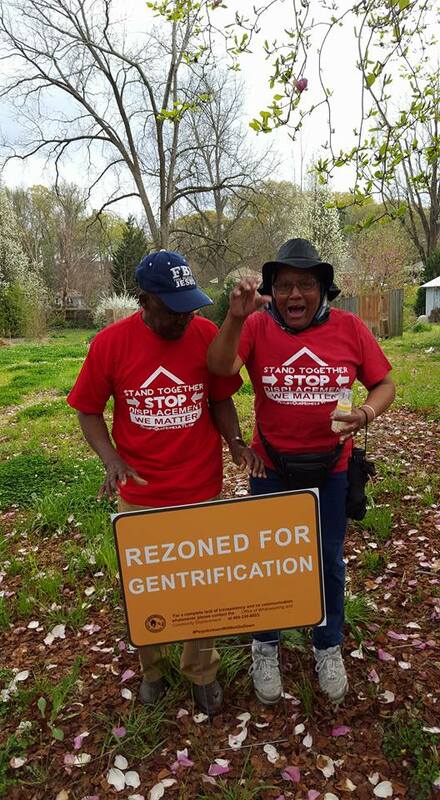 As we marched around the block, we stopped and placed "rezoned for gentrification" signs in lots where houses used to stand. All of the houses between Tanya's House and the Darden's house have been bulldozed. 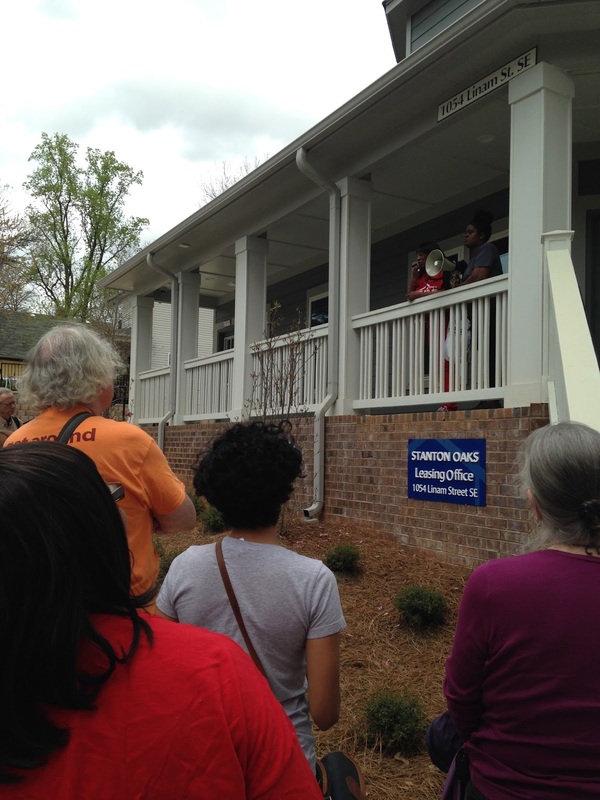 Throughout the march we chanted and sang to let our voices be know to the neighborhood that "we shall not be moved." 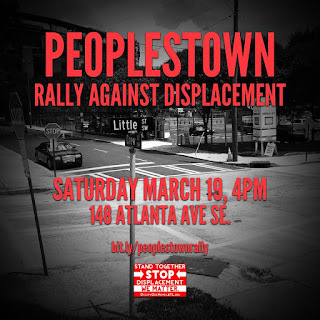 Peoplestown Residents and Allies to Hold Press Conference, Rally and March Against Displacement from the Community They Love and Helped Build! As the eye of the City's development becomes fixated on the Peoplestown community we see more and more big and small development deals in the surrounding area that threaten to displace long-term residents from the communities they love and helped build. The City’s proposed storm water plan to address flooding issues in Peoplestown and its surrounding areas is not acceptable to many residents because it does not provide a sustainable solution to the flooding issues. The problem can be and must be solved without displacing people. 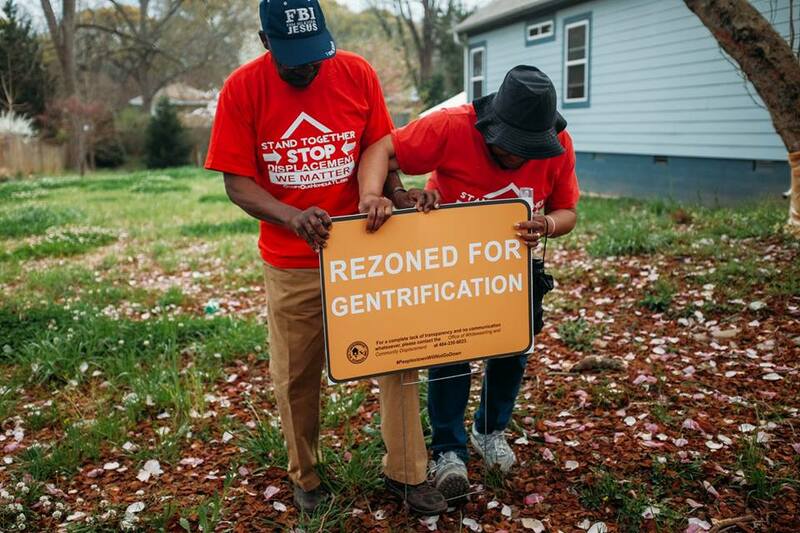 On March 19th residents and allies plan to fill the yards of those who intend to stay in their homes despite threats of displacement from the City. 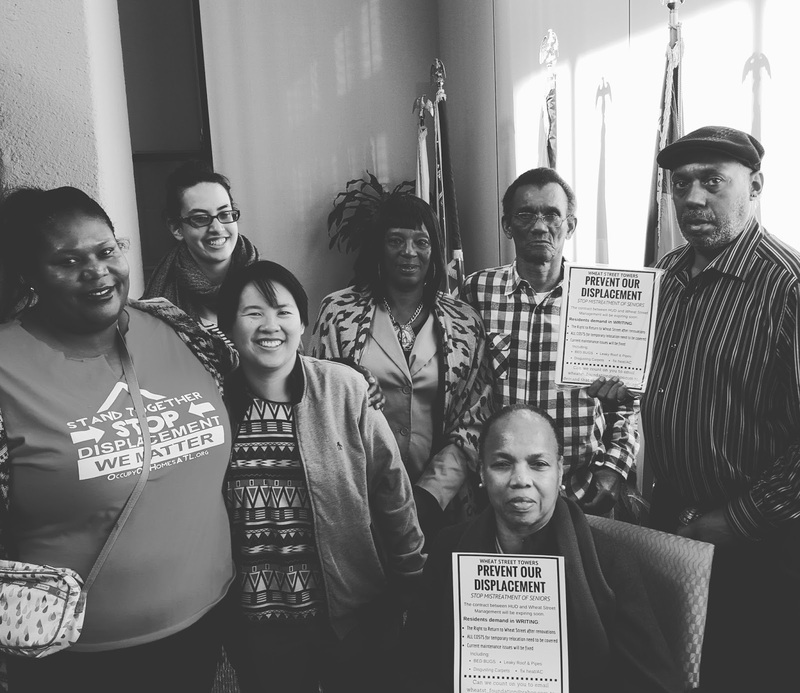 The campaign has already saved one of their neighbors from displacement and the remaining residents are calling on you to help ensure that they can also stay in their homes. Mr. and Mrs. Darden, who live on the block, have encouraged the City “to do the right thing!” Resident Tanya Washington, whose 91 year old home has never flooded, notes that she “doesn’t need to be saved from a flood; she needs to be saved from the City.” These residents and their allies understand that the displacement, lack of affordable housing and environmental injustice issues are all plaguing their community and they are rallying and marching for change! We will be meeting at resident Tanya Washington's yard (148 Atlanta Ave SE ) at 4pm for a press conference and rally followed by a march around the block with members of the Peoplestown community and special guests and supporters. Join us!! 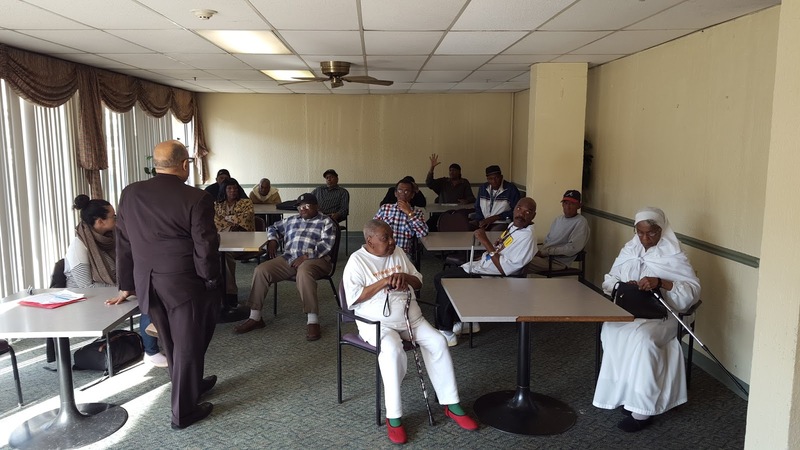 Wheat Street Towers is a Senior High Rise that's provided an affordable housing option for Senior Citizens in the Old 4th Ward for decades. in the last five years Old 4th Ward has gone from affordable to being the most expensive place in the city to find housing. many of the tenants of Wheat Street towers participated in the civil rights movement of the 60's. The marched, they traveled to DC, they shed blood, sweat, and tears for their freedom. Now their fighting to remain in the community they love and live in acceptable living conditions. 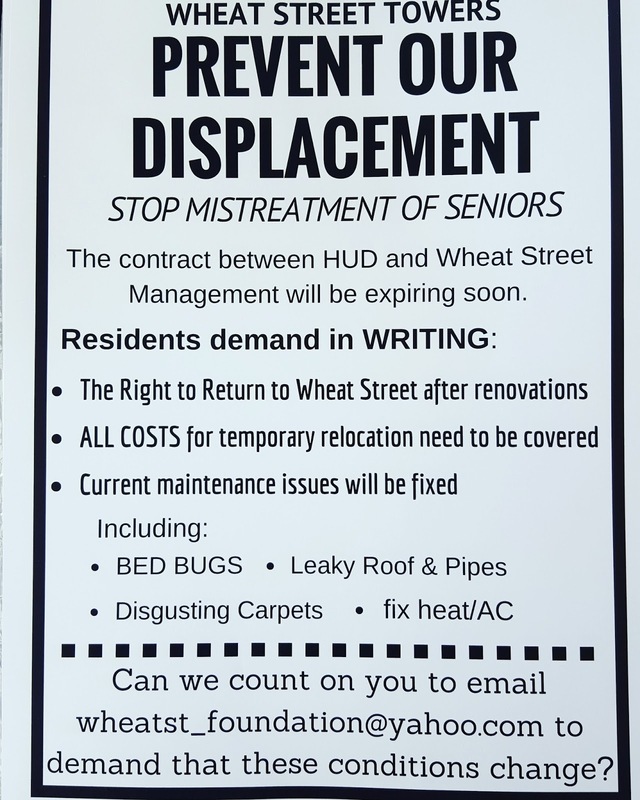 We have had the pleasure and privilege to work alongside Wheat Street tenants for the last few months and have experienced many of the conditions that cause them concern and the lack of communication between tenants and the owners of the complex. The HUD contract is set to expire this year, which means the subsidies that make Wheat Street affordable could no longer be available. 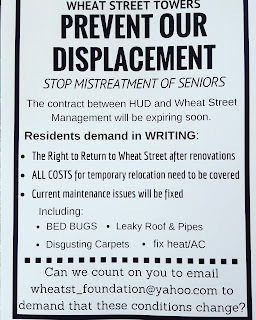 The tenants demands are very simple; they want an improved quality of life, they want to remain in the community they love, and they want to know the intentions of the owners. Because of the depth of the infrastructure issue with the building it's clear that there will have to be temporary displacement in order for the building to be fixed to code and quality of life measures that our senior citizens deserve. Tenants want it in writing that their moving expenses will be covered and they will all have the right to return to their homes and enjoy renovations. 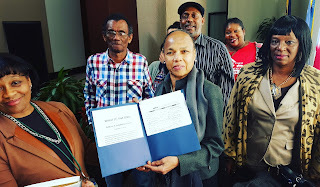 Today we delivered a petitions signed by almost every tenant to HUD southeastern HG in Atlanta. We were extremely honored to be joined by State Senator Vincent Fort as we prepared to deliver the petition. It's our hope that the owners will soon sign a new 20 year HUD contract and make their renovations plans and temporary reelection plans clear and i writing. Our senior citizens deserve to live in quality conditions and enjoy the twilight of their lives instead of being put in a position of stress and confusion about their living situation. We will continue to work alongside tenant leaders until their demands our met. Peoplestown USA from Adam Patterson on Vimeo. On February 24th we held a film screening of Peoplestown USA, which was followed by a panel discussion and conversation. 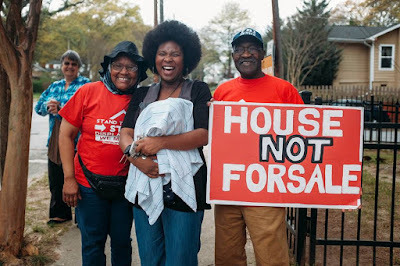 Peoplestown USA focuses on Tanya Washington and Bertha & Robert Darden's fight to keep their homes and prevent displacement through the broader context of gentrification and development. We encourage folks to watch and share the film! Big thanks to Adam Patterson for putting this film together and to GSU's American Constitution Society for hosting this event. We look forward to working with community groups to organize film screenings of Peoplestown USA!